rhubarb week commence! this past weekend i went on a hunt for the biggest & brightest rhubarb in the city. 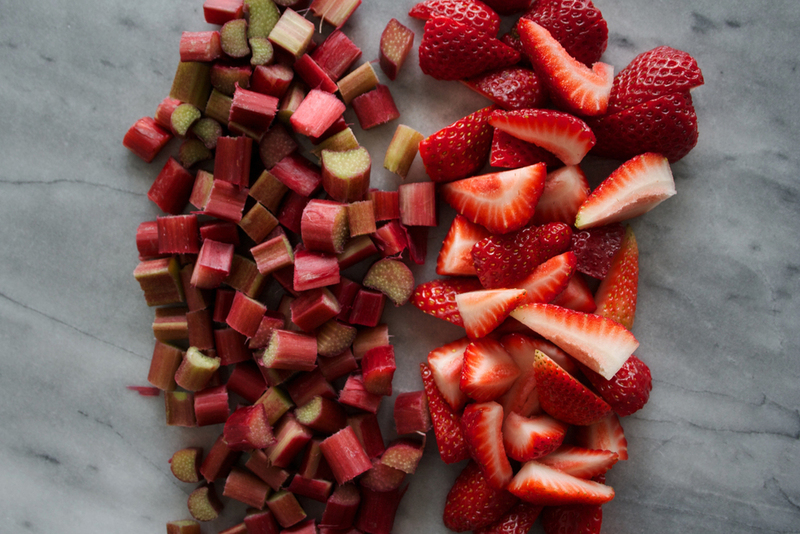 i ended up finding a beautiful bunch of ontario grown rhubarb from the farmers market in liberty village, along side some strawberries and asparagus. i like to call rhubarb 'pink celery' as not many people are familiar with what it looks like outside of a strawberry rhubarb pie. when my mom was growing up rhubarb used to grow wild in her backyard and they would eat it raw dipped in sugar. like a fresh jolly rancher! the pie crust is a butter based dough and full of buttery flavour. i have yet to make a pie dough using shortening (shortening scares me) because butter, right? maybe one day i will try to do a butter + shortening mixed crust, but for now this crust compliments the sweet & sour filling perfectly! plus, the bright pink & red colours look and photograph amazing. for the dough: using a food processor (can be done by hand too), pulse the flour, salt and sugar a few times to blend. add the cubed butter and vanilla. pulse until a crumb like texture is formed. slowly add the cold water one tablespoon at a time until a dough begins to form (if you accidentally add too much water add a bit more flour). once the dough begins to come together, turn out onto a pastry board and form into a disk using your hands. 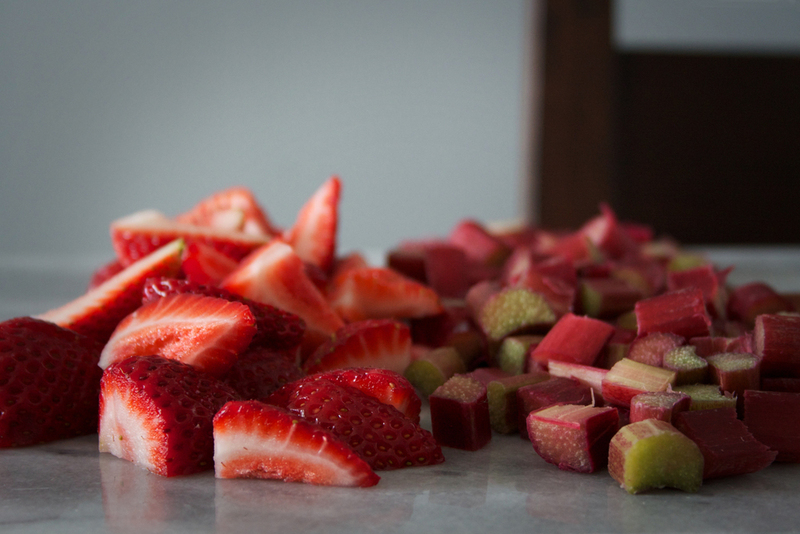 for the filling add rhubarb, strawberries, sugar, lemon juice, salt, and corn starch in a mixing bowl. toss until sugar is evenly mixed. to assemble roll out half the dough to approximately a 1/4 inch thickness. cover pie plate, trim, poke air holes, and pinch in edges. cook at 400 degrees for 25 minutes, turn temperature down to 350 degrees and cook for another 30 minutes. 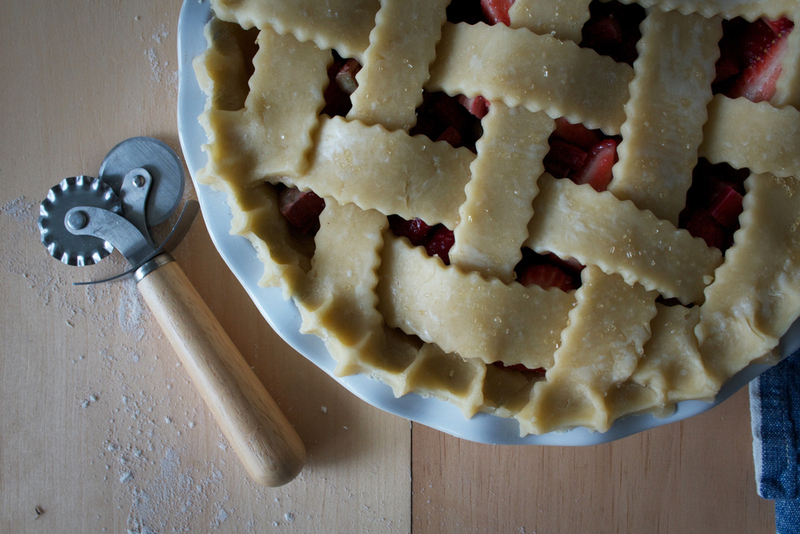 let pie cool to room temperature to set before slicing.